Valentine’s Day is one of the most celebrated days in the world. Dedicated to love, it is estimated that up to 500 million paper and electronic cards are send on this day, making it one of the most popular card sending day of the year. One legend contends that Valentine was a priest who served during the third century in Rome. When Emperor Claudius II decided that single men made better soldiers than those with wives and families, he outlawed marriage for young men. Valentine, realising the injustice of the decree, defied Claudius and continued to perform marriages for young lovers in secret. When Valentine’s actions were discovered, Claudius ordered that he be put to death. It was reported that when he was beheaded a blossom tree grew on the spot where he was buried cementing his reputation as the patron saint of lovers.Later on Pope Gelasius I dedicated February 14th to the saint and martyr Valentine, in order to replace pagan festivals prevalent at the time. This date spread across the world and in the UK, the Victorians really went to town celebrating St Valentine’s Day. At some point there were dedicated factories producing beautiful cards, some of them bespoke; being made from lace and ribbon. It is estimated that Britons spend over £1.5bn on cards, flowers and other gifts, with over half the population involved in celebrating the day. The luxury cake sector has not been left out, and at Elizabeth’s Cake Emporium, over the years we have designed a number of Valentine Cakes which we are delighted to share with you. The first luxury valentine wedding cake we’d like to share is a red cake covered entirely with the most darling red sugar roses. 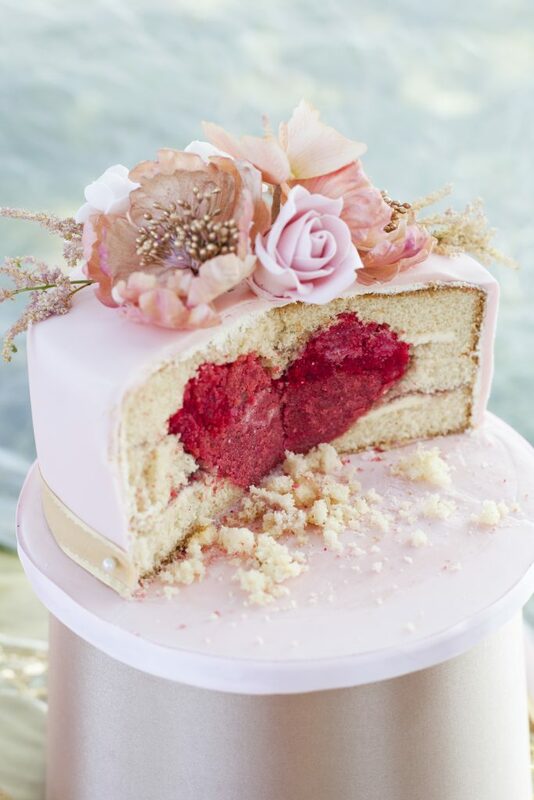 Red is the colour of love and passion and this cake certainly speaks volumes. The second cake is slightly off the beaten path. 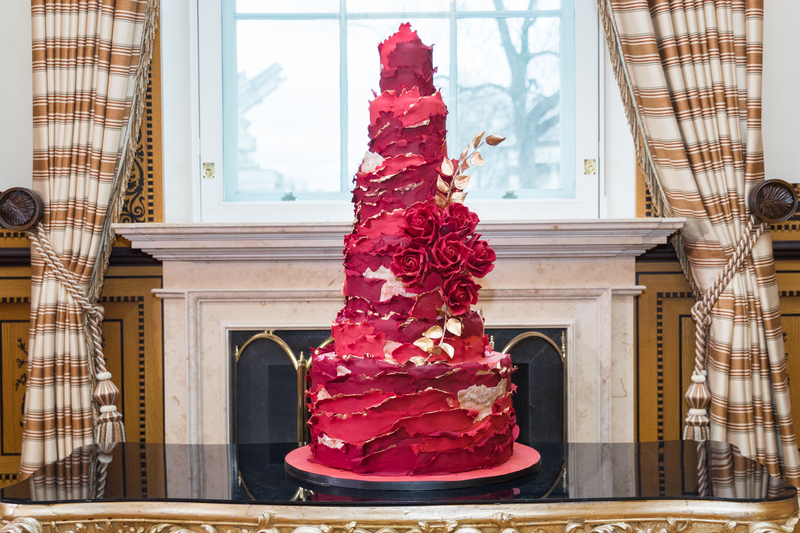 Whilst also deep red in colour, this 7 tier asymmetrical frilled beauty has torn up pieces of printed edible wafer paper love notes incorporated into the cake design. It also features handcrafted deep red roses and sugar gold leaves. The ultimate declaration of love is a willingness to share cake with a loved one. Heart shaped cakes, cookies, cupcakes and sweets are some of the most popular treats shared on Valentine’s Day and we have made them in colours ranging from white, blush to red. We have designed a number of alternative cakes with the most memorable being an anatomically inspired heart. We have done a few of these, and the surprise on a loved one’s face is always a delight.